75% of Travelers will CHANGE THEIR PLANS as a Direct Result of Picking Up a Rack Brochure. Nearly 6 million visitors come to the Richmond area each year. Over 73% of travelers become aware of a business through a brochure. 64% of travelers make plans as a direct result of picking up a brochure. Our large distribution network is a direct result of the strong and long-standing relationships we’ve built with area hotels and other organizations over decades. This is your guarantee that your message will be seen. We Help You Break Through Where Your Competition Can’t Many hotels have eliminated brochures that clutter the front desk and concierge area. This has had a negative impact on area businesses that counted on hotels to help them reach travelers. The good news is that Virginia Select’s attractive display cases meet new hotel requirements, giving only our clients access to this invaluable marketing venue. High-visibility, high-traffic areas.Attractive, quality and attention-getting cases. 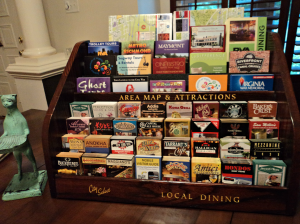 Virginia Select’s Rack Card Distribution Program is ideal for: Attractions, services, retail, and any business that desires to communicate specific offerings that motivate action, and be in front of the customer at decision-making time. Get the latest news on attracting more customers to your business. Click On the Logo Below to sign up.